Why do perfectly shaped eyebrows seem so elusive? A pair of well groomed brows can complement your eyes and completely transform your face. But why do they seem so hard to come by? The answer to this might lie in the technique you use to shape your eyebrows. Eyebrow threading is a superior temporary hair removal method when it comes to shaping your brows. Not only is it quick and efficient, but you can also do it yourself in the comfort of your home. 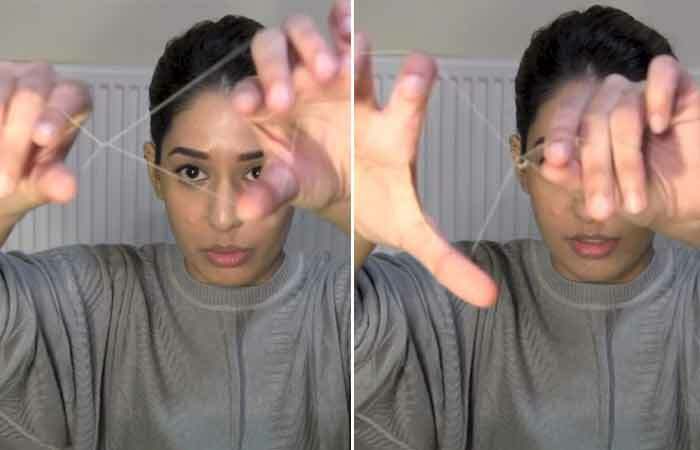 In this article, you will find everything you need to know about eyebrow threading and an easy tutorial for threading your eyebrows at home. 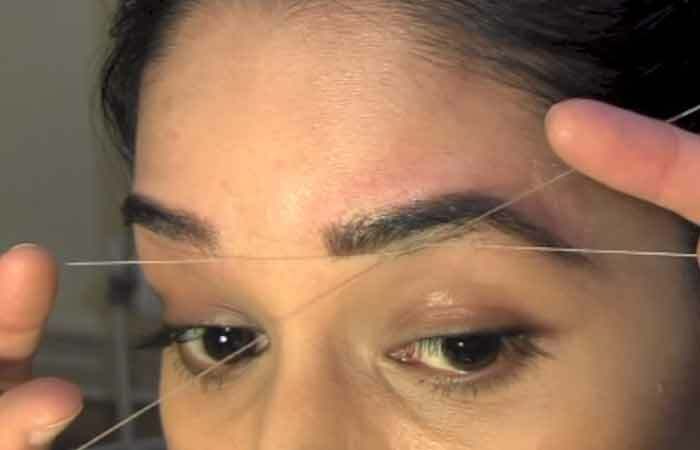 Threading is an ancient hair removal method with temporary results. It is popularly used to remove hair from areas such as the eyebrows, around the lips, cheeks, and chin. The technique incorporates the use of cotton threads that are twisted and used to pull the hair from the root, much like waxing and tweezing. 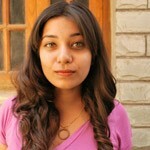 However, the results from threading are sharper and more defined. This technique can remove fine and short hair for cleaner results. 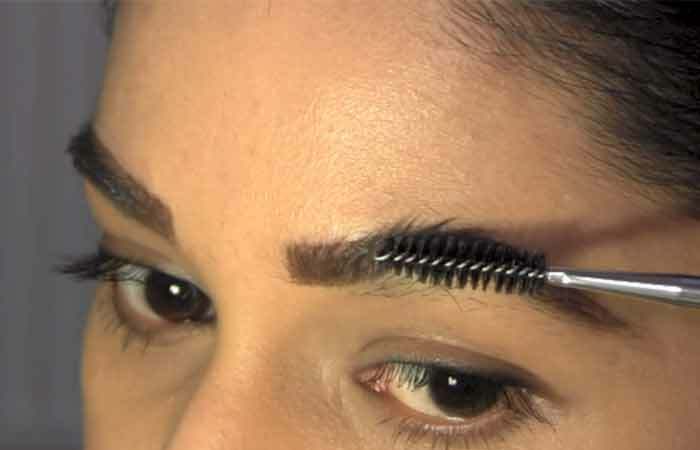 Not only is eyebrow threading much more efficient than tweezing or waxing, but it is also much safer. It removes the hair from the root without pulling at your skin too much. 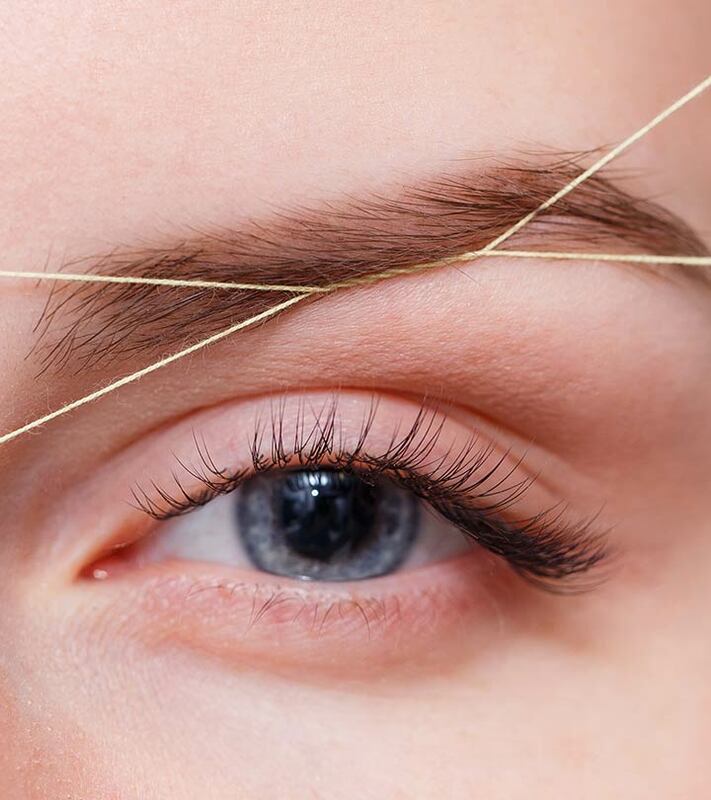 Although threading can be as painful as waxing, it is quick and gives you symmetrical and long-lasting results. Tweezing is time consuming, and waxing can leave the fragile skin around your eyebrows feeling sore for an entire day. This is why threading is a safer and superior alternative. Get all your supplies together and stand in front of a mirror in a well-lit room. Position yourself so that you can clearly see your eyebrows. Do not use a magnifying mirror as it is easy to over thread when using one. Once you are done with trimming your brows, you need to draw out an outline of the shape you want. Starting from the inside of your brow, draw the outline in an outward sweeping motion. 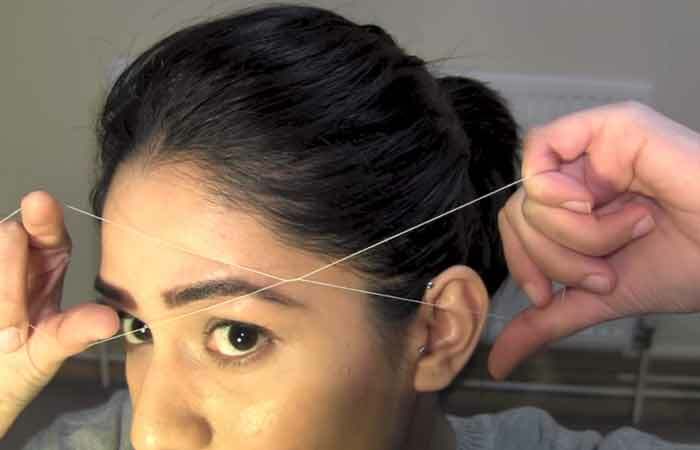 This is a crucial step and must not be skipped, especially if you are threading your eyebrows for the first time. Take both the natural shape of your eyebrows and the shape you want into consideration when drawing the outline. For example, if you have thin brows, it is ideal to draw out a thinner arch. Using an eyebrow brush, sweep your eyebrow hair upwards. Hold the section in place with the brush and use a pair of eyebrow scissors to trim the end of the longer hairs. After this, comb the hair downwards and repeat the trimming process with any long hairs that might stick out from underneath the brush. Ensure that you do not over trim while doing this. Once you are done with trimming both your eyebrows, brush the hair back in place. Your eyebrows should look slightly groomed and clean. Trimming helps give your eyebrows a neater, fuller look while shortening longer strands so that it is easier for you to thread. Take your piece of thread and tie its two ends to form a loop. Ensure that the knot is tight and trim off the loose ends so that you have a clean loop. 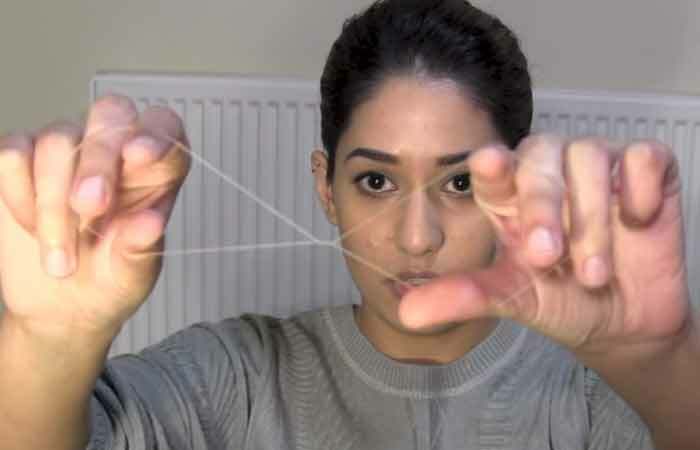 Hold one side of the loop open with your thumb and forefinger and place your other thumb and forefinger in between the thread on the other side. Use one hand to twist the thread about 4-5 times while keeping your other hand still. After twisting the loop, you should have a twisted section in the middle. Opening and closing the distance between your thumb and forefinger on each side of the twisted section will help move it from side to side. Open one hand while you close the other to move the twist. Keep practicing this motion until you get the hang of it and are confident. If you have some difficulty with this, try shortening the thread a little and try again. You can also try using your middle and ring finger if you find that to be more comfortable. 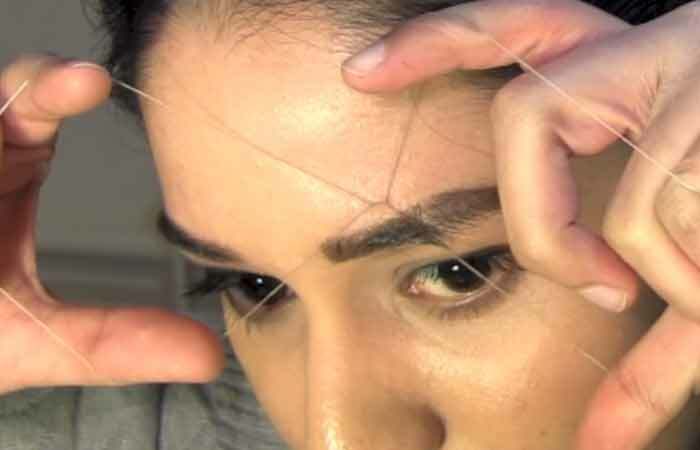 Position the twisted center of the thread over your eyebrow right on top of the hairs you want to remove. Close the hand that is in control of the twisted center while you open the other. Slide the twist across your skin in a slow but firm motion. The corners of the twist will help grab and remove your hair as it moves. The twist must always move in the direction opposite to that of your hair growth. Be gentle while you thread your eyebrows. You do not want to be too harsh or tug on your skin as this can be painful. Once you’re done with your first stroke, reposition the twist onto a new section of hair that you want to remove. Repeat this process and continue until you have achieved your desired shape. Once you get the hand of this, you will be able to tackle larger sections of hair in one stroke. 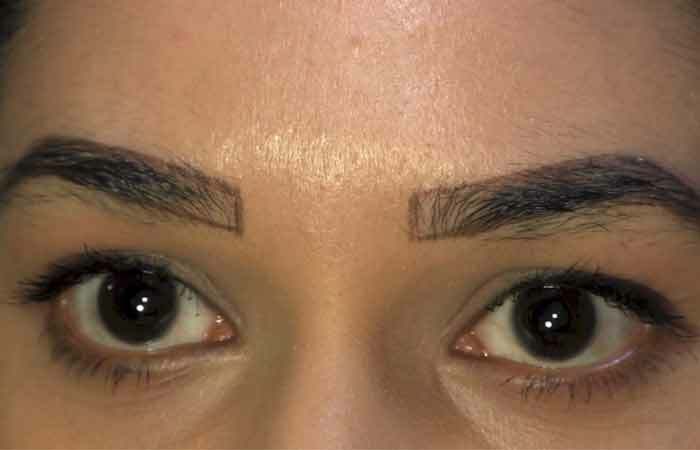 Do not forget to thread in between your eyebrows. Once you are done with threading your brows, you will notice a little redness and your skin might feel a bit sore. 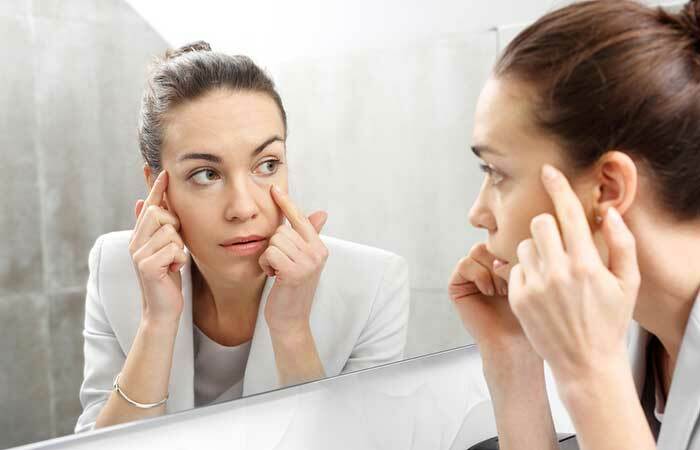 To help remedy this, and to prevent infection, apply some aloe vera or an ice-pack wrapped in cloth to your brows. Examine your eyebrows after a couple of hours to see if there are any stray hairs that you missed. It is important to take the shape of your face into consideration when deciding on how to shape your eyebrows. Even the most gorgeously groomed pair of brows can look unflattering when paired with the wrong face shape. 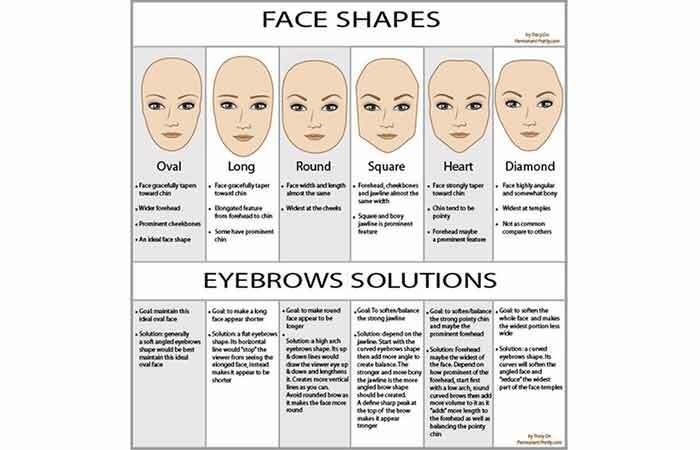 To gain some insight on how you should shape your brows to complement your face, look at the guide below. Count yourself lucky if you have an oval face as it is almost impossible to go wrong while deciding on a style. This is because most eyebrow shapes complement an oval face. If you want to play it safe, maintain medium thick eyebrows with a soft angle. With long faces, the goal is to minimize the length of your face. The best way to achieve this is to have flat brows with a slight curve where the arch is supposed to be. Flatter brows help distract from the length of your face, perfectly complementing an oblong face. If you have a round face, the trick is to make your eyebrows look sharp to balance out your soft features. Your eyebrows should be shaped with high and sharp arches. This will help cut the fullness of a round face and will even create the illusion of length. With a square-shaped face, you need to work to balance out the sharpness of the features while adding the illusion of length. This can be achieved by shaping your eyebrows in a way that they are high but have a soft curve instead of sharp arches. When working with a heart-shaped face, the goal is to distract attention from the strong pointy chin. This can be achieved by keeping the curves soft. The arch should be kept low and full to add the appearance of length to your forehead. If you have a diamond-shaped face, you must keep in mind that the brow and temple region of your face is the widest. The goal is to balance this out and create softness to counter the sharp features. For this, you need to create a prominent but full curve to reduce the appearance of width, while softening your features. Steam your face or shower in hot water before you thread your eyebrows. This will help soften your hair and open your pores so that it is easier to remove hair. If you are extremely sensitive to pain, use a drugstore anesthetic cream or teething gel a few minutes before starting to numb the area. Dust on some talc onto the brow region before threading. This helps with the gripping during the process. 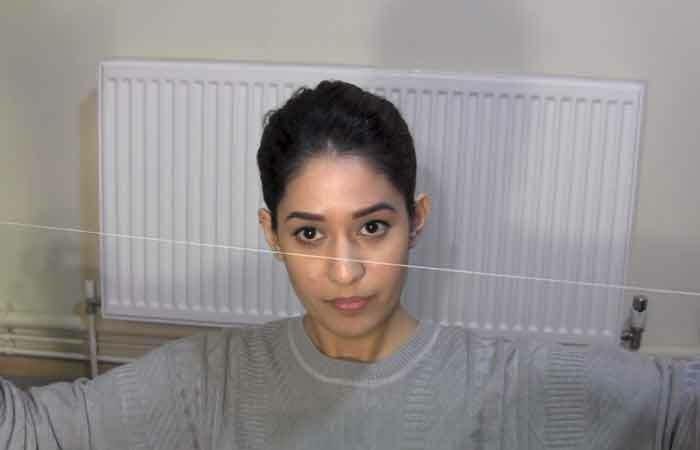 How long does eyebrow threading take? Depending on your speed, eyebrow threading can take anywhere between 3-7 minutes. Eyebrow threading can be as painful as waxing, especially if it is your first time doing it. However, your hair grows out thinner after threading, making it less painful the next time. How to make threaded eyebrows last longer? Threaded eyebrows take about 6-10 weeks to grow back. You can extend this by going in with tweezers or re-threading everytime you start to notice stray hairs growing back. 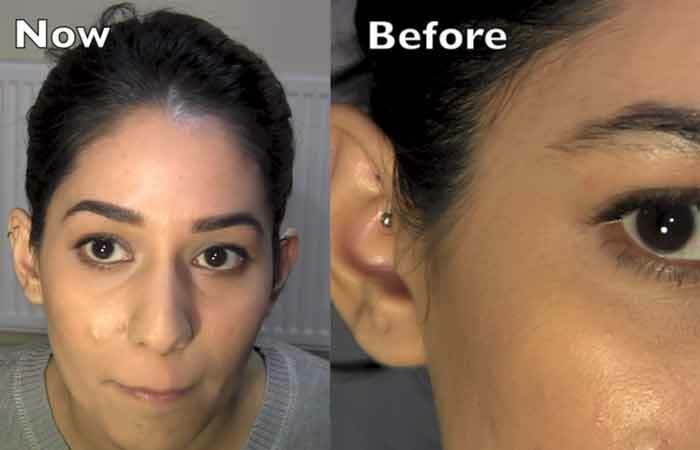 What to do after threading your eyebrows? 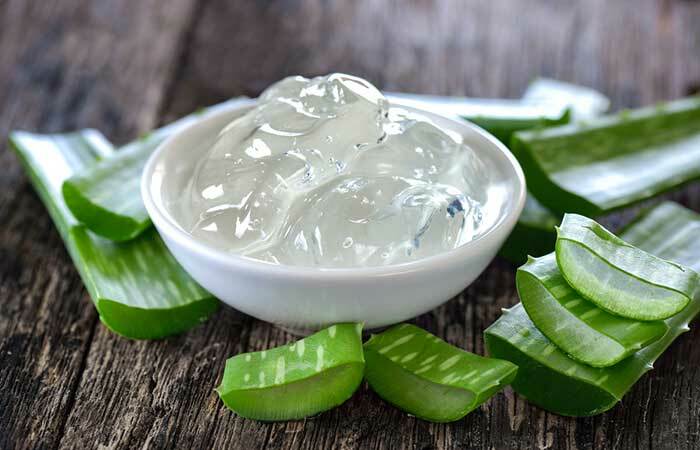 You may experience some redness and soreness after you thread your eyebrows, use aloe vera gel or an ice pack to soothe this. How to shape your eyebrows without threading? Waxing, tweezing, and shaving are some of the popular alternatives to threading your eyebrows. However, although painful, threading is one of the most efficient ways to shape your brows. Perfectly groomed brows don’t have to be so elusive. 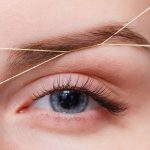 Although threading might seem quite tricky to figure out, it is one of the most efficient methods for shaping your eyebrows. Have you ever threaded your brows? Tell us about your experience in the comments section below.